Select an African candle holder to evoke the spirit of Africa in your living room, dining room, or bedroom. An African oasis theme is popular and blends in well with many decorating styles. With its focus on natural materials, smooth exteriors, and mostly human, animal and geometric forms, African candle holders add a sculptural detail with strong, clean lines to your decor. For an authentic touch, decorate your home with these crafts rich in history. 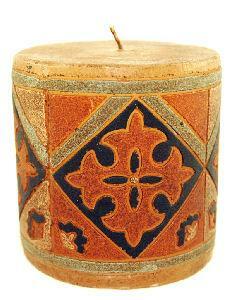 Many common styles of candle holders, including candlesticks, sconces, and jars are found among African styles. Forms frequently found on African holders include geometric, animal and human designs. Smooth finishes are common, even on intricate geometric patterned candlesticks. Artisans take great pride in creating a smooth, almost shiny surface, and labor long and hard to achieve this effect. Carvers create many works solely by hand. Common materials include ebony wood and soapstone. Modern artists use metal and often depict families, couples, and children. Wrought iron candle holders depicting African themes are growing in popularity, particularly those celebrating African family life. African crafts include many geometric designs. Artisans embellish everything from candlesticks to textiles with squares, diamonds, and other patterns. Candleholders are often carved with intricate geometric designs, particularly wooden ones. These make terrific accent pieces in modern-styled homes. Many holders for taper-style candles carved sport geometric patterns. Popular animals abound in African works. Common styles include realistic elephants, giraffes and zebras. Display fat pillar candles atop an elephant-styled pedestal, or enjoy votives in tiny cups painted with your favorite African animal. Your African candle holder can be whimsical or realistic, carved or painted. According to the exhibit catalog for African art published by the University of Virginia, one of the highest compliments you can give an African artist is to tell him his work "looks like a human being." Realistic figures portraying the graceful faces of various tribes frequently adorn African candlesticks. Modern artisans prefer working metal into action figures, and family themes are quite common. Find busts, portraits, and full figures carved in a variety of materials. No discussion of African-style candle holders is complete without mention of Kwanzaa. Kwanzaa is a seven-day festival celebrating African heritage and family. Created by Dr. Maulana Karenga in 1966 to enhance cultural pride during a period of civil unrest, Kwanzaa has grown in popularity in the United States. The festival begins December 26th and lasts for seven days. Each evening during Kwanzaa, a family member, usually the youngest child, lights a candle on the Kwanza candle holder. The sixth day, which falls on New Year's Day, calls for a family feast. The Kwanzaa candle holder contains seven cups for seven candles, one for each day of the festival. Complete the African decorating theme by including authentic African candles. Easily found on the Internet, African candles come in bright colors with shades ranging from ochre to burgundy. Find tapers, pillars and votives embellished with rich color, beads, and geometric symbols to complete your decorating project. You can also try to make your own candles using photos in books, magazines and on the internet as your inspiration. You can support artisans in Africa by purchasing crafts online. A rich resource to learn about African Crafts, this site offers details on the arts and artisans who made them. For more information on the African art esthetic, which includes sculpture and sculptural crafts such as candle holders, the University of Virginia has a former exhibition catalog online. While the exhibit focused on sculpture, the strong flavor of African arts influences candle making and other crafts too. The Kwanzaa story explains the history and development of Kwanzaa.